Sticks come in different lengths and different weights, and many factors go into choosing a new stick. Position, experience, and skill all should be considered as you make your decision. Below are some general guidance for choosing a stick, but most would agree that color is probably not the best decision criteria (but we have been told is often the deciding factor). Elite sticks combine innovation and technology to create the most advanced field hockey sticks in the world. These sticks are designed to maximize power. Advanced sticks are for the cutting-edge, progressive athlete. These field hockey sticks are powerful, but more flexible than the Elite-level sticks, allowing for softer receiving. Competitive sticks are more flexible, enhancing ball control. These field hockey sticks produce less vibration, but still provide adequate power. Junior and wood sticks provide maximum control, making them great for the new field hockey player. 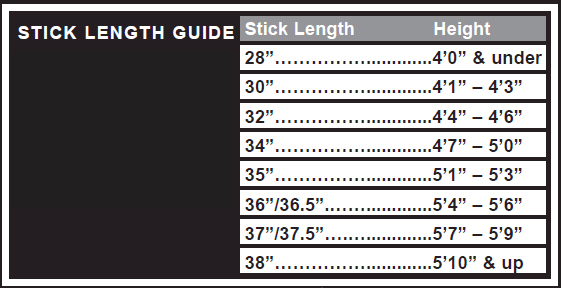 There is not an exact science when it comes to choosing the correct length of a field hockey stick. 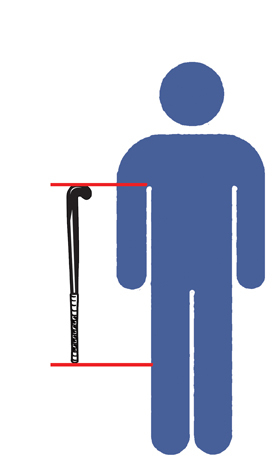 Players have different preferences based on their level of play and what feels best to them.There are two methods in which a stick can be chosen. One is based on a height chart and the other is a Dutch sizing method. Hold your field hockey stick upside down, with the head in the air, and insert the head into your armpit, as if it were a crutch. The end of the handle should fall between the middle of your kneecap to no more than two inches below the bottom of your kneecap.